Now that it’s looking like full on winter and Lake Michigan is starting to freeze(check out manisteesurfcam.com, the ice is just starting to form) there isn’t much hope for kiteboarding so I’ve been doing some reading. 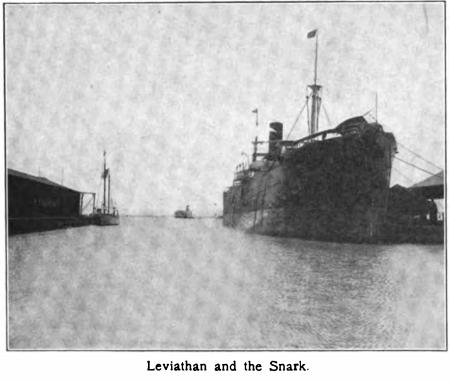 I came across a book by Jack London called “The Cruise of the Snark” which was published in 1911. It’s a nonfiction book that details an adventure that the author and his friends had in a sailboat trip around the world. 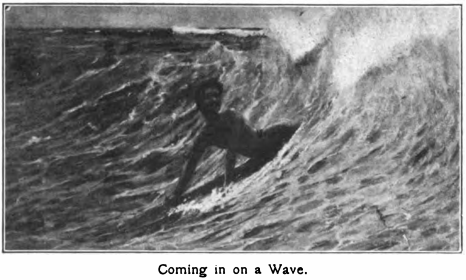 One of their stops was Hawaii and Jack London describes his first attempts at learning and becoming a surfer. 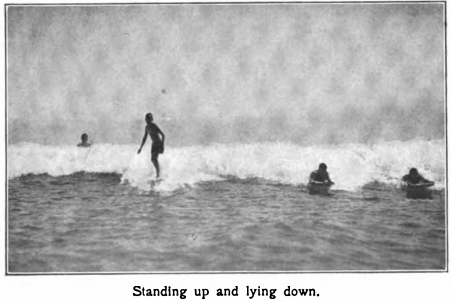 Surfing was an unknown sport to mainlanders when this book was published. It’s a great read and it’s funny that the way Jack describes learning to surf back then is the same as it is now. The book is now public domain so I have included an excerpt below from Jack’s time surfing in Waikiki or you can also download the full book from Google Books in Epub or PDF format. “A Royal Sport”. Excerpt from Jack London’s “The Cruise of the Snark”. 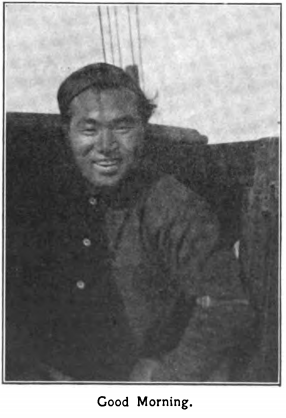 Published 1911. “That is what it is, a royal sport for the natural kings of earth. The grass grows right down to the water at Waikiki Beach, and within fifty feet of the everlasting sea. The trees also grow down to the salty edge of things, and one sits in their shade and looks seaward at a majestic surf thundering in on the beach to one’s very feet. Half a mile out, where the reef is, the white-headed combers thrust suddenly skyward out of the placid turquoise-blue and come rolling in to shore. One after another they come, a mile long, with smoking crests, the white battalions of the infinite army of the sea. And one sits and listens to the perpetual roar, and watches the unending procession, and feels tiny and fragile before this tremendous force expressing itself in fury and foam and sound. Indeed, one feels microscopically small, and the thought that one may wrestle with this sea raises in one’s imagination a thrill of apprehension, almost of fear. Why, they are a mile long, these bull-mouthed monsters, and they weigh a thousand tons, and they charge in to shore faster than anyone can run. What chance? No chance at all, is the verdict of the shrinking ego; and one sits, and looks, and listens, and thinks the grass and the shade are a pretty good place in which to be. And suddenly, out there where a big smoker lifts skyward, rising like a sea-god from out of the welter of spume and churning white, on the giddy, toppling, overhanging and downfalling, precarious crest appears the dark head of a man. Swiftly he rises through the rushing white. His black shoulders, his chest, his loins, his limbs — all is abruptly projected on one’s vision. Where but the moment before was only the wide desolation and invincible roar, is now a man, erect, full-statured, not struggling frantically in that wild movement, not buried and crushed and buffeted by those mighty monsters, but standing above them all, calm and superb, poised on the giddy summit, his feet buried in the churning foam, the salt smoke rising to his knees, and all the rest of him in the free air and flashing sunlight, and he is flying through the air, flying forward, flying fast as the surge on which he stands. He is a Mercury — a brown Mercury. His heels are winged, and in them is the swiftness of the sea. In truth, from out of the sea he has leaped upon the back of the sea, and he is riding the sea that roars and bellows and cannot shake him from its back. But no frantic outreaching and balancing is his. He is impassive, motionless as a statue carved suddenly by some miracle out of the sea’s depth from which he rose. And straight on toward shore he flies on his winged heels and the white crest of the breaker. There is a wild burst of foam, a long tumultuous rushing sound as the breaker falls futile and spent on the beach at your feet; and there, at your feet steps calmly ashore a Kanaka, burnt golden and brown by the tropic sun. Several minutes ago he was a speck a quarter of a mile away. He has “bitted the bull-mouthed breaker” and ridden it in, and the pride in the feat shows in the carriage of his magnificent body as he glances for a moment carelessly at you who sit in the shade of the shore. He is a Kanaka — and more, he is a human being, a member of the kingly species that has mastered matter and the brutes and lorded it over creation. And one sits and thinks of Tristram’s last wrestle with the sea on that fatal morning; and one thinks further, to the fact that Kanaka has done what Tristram never did, and that he knows a joy of the sea that Tristram never knew. And still further one thinks. It is all very well, sitting here in the cool shade of the beach, but you are a human being, one of the kingly species, and what that Kanaka can do, you can do yourself. Go to. Strip off your clothes that are a nuisance in this mellow clime. Get in and wrestle with the sea; wing your heels with the skill and power that reside in you; bit the sea’s breakers, master them, and ride upon their backs as a king should. And that is how it came about that I tackled surf-riding. And now that I have tackled it, more than ever do I hold it to be a royal sport. But first let me explain the physics of it. A wave is a communicated agitation. The water that composes the body of the wave does not move. If it did, when a stone is thrown into a pond and the ripples spread away in an ever widening circle, there would appear at the center an ever increasing hole. No, the water that composes the body of a wave is stationary. Thus, you may watch a particular portion of the ocean’s surface and you will see the same water rise and fall a thousand times to the agitation communicated by a thousand successive waves. Now imagine this communicated agitation moving shoreward. As the bottom shoals, the lower portion of the wave strikes land first and is stopped. But water is fluid, and the upper portion has not struck anything, wherefore it keeps on communicating its agitation, keeps on going. And when the top of the wave keeps on going, while the bottom of it lags behind, something is bound to happen. The bottom of the wave drops out from under and the top of the wave falls over, forward, and down, curling and cresting and roaring as it does so. It is the bottom of a wave striking against the top of the land that is the cause of all surfs. But the transformation from a smooth undulation to a breaker is not abrupt except where the bottom shoals abruptly. Say the bottom shoals gradually for from a quarter of a mile to a mile, then an equal distance will be occupied by the transformation. Such a bottom is that off the beach of Waikiki, and it produces a splendid surf-riding surf. One leaps upon the back of a breaker just as it begins to break, and stays on it as it continues to break all the way in to shore. And now to the particular physics of surf-riding. Get out on a flat board, six feet long, two feet wide, and roughly oval in shape. Lie down upon it like a child on a coaster and paddle with your hands out to deep water, where the waves begin to crest. Lie out there quietly on the board. Sea after sea breaks before, behind, and under and over you, and rushes in to shore, leaving you behind. When a wave crests, it gets steeper. Imagine yourself, on your board, on the face of that steep slope. If it stood still, you would slide down just as a child slides down a hill on his or her coaster. “But,” you object, “the wave doesn’t stand still.” Very true, but the water composing the wave stands still, and there you have the secret. If ever you start sliding down the face of that wave, you’ll keep on sliding and you’ll never reach the bottom. Please don’t laugh. The face of that wave may be only six feet, yet you can slide down it a quarter of a mile, or half a mile, and not reach the bottom. For, see, since a wave is only a communicated agitation or impetus, and since the water that composes a wave is changing every instant, new water is rising into the wave as fast as the wave travels. You slide down this new water, and yet remain in your old position on the wave, sliding down the still newer water that is rising and forming the wave. You slide precisely as fast as the wave travels. If it travels fifteen miles an hour, you slide fifteen miles an hour. Between you and the shore stretches a quarter of mile of water. As the wave travels, this water obligingly heaps itself into the wave, gravity does the rest, and down you go, sliding the whole length of it. If you still cherish the notion, while sliding, that the water is moving with you, thrust your arms into it and attempt to paddle; you will find that you have to be remarkably quick to get a stroke, for that water is dropping astern just as fast as you are rushing ahead. And now for another phase of the physics of surf-riding. All rules have their exceptions. It is true that the water in a wave does not travel forward. But there is what may be called the send of the sea. The water in the overtoppling crest does move forward, as you will speedily realize if you are slapped in the face by it, or if you are caught under it and are pounded by one mighty blow down under the surface panting and gasping for half a minute. The water in the top of a wave rests upon the water in the bottom of the wave. But when the bottom of the wave strikes the land, it stops, while the top goes on. It no longer has the bottom of the wave to hold it up. Where was solid water beneath it, is now air, and for the first time it feels the grip of gravity, and down it falls, at the same time being torn asunder from the lagging bottom of the wave and flung forward. And it is because of this that riding a surfboard is something more than a mere placid sliding down a hill. In truth, one is caught up and hurled shoreward as by some Titan’s hand. I deserted the cool shade, put on a swimming suit, and got hold of a surfboard. It was too small a board. But I didn’t know, and nobody told me. I joined some little Kanaka boys in shallow water, where the breakers were well spent and small — a regular kindergarten school. I watched the little Kanaka boys. When a likely-looking breaker came along, they flopped upon their stomachs on their boards, kicked like mad with their feet, and rode the breaker in to the beach. I tried to emulate them. I watched them, tried to do everything that they did, and failed utterly. The breaker swept past, and I was not on it. I tried again and again. I kicked twice as madly as they did, and failed. Half a dozen would be around. We would all leap on our boards in front of a good breaker. Away our feet would churn like the sternwheels of river steamboats, and away the little rascals would scoot while I remained in disgrace behind. I tried for a solid hour, and not one wave could I persuade to boost me shoreward. And then arrived a friend, Alexander Hume Ford, a globe trotter by profession, bent ever on the pursuit of sensation. And he had found it at Waikiki. Heading for Australia, he had stopped off for a week to find out if there were any thrills in surf-riding, and he had become wedded to it. He had been at it every day for a month and could not yet see any symp-toms of the fascination lessening on him. He spoke with authority. I am always humble when confronted by knowledge. Ford knew. He showed me how properly to mount his board. Then he waited for a good breaker, gave me a shove at the right moment, and started me in. Ah, delicious moment when I felt that breaker grip and fling me. On I dashed, a hundred and fifty feet, and subsided with the breaker on the sand. From that moment I was lost. I waded back to Ford with his board. It was a large one, several inches thick, and weighed all of seventy-five pounds. He gave me advice, much of it. He had had no one to teach him, and all that he had laboriously learned in several weeks he communicated to me in half an hour. I really learned by proxy. And inside of half an hour I was able to start myself and ride in. I did it time after time, and Ford applauded and advised. For instance, he told me to get just so far forward on the board and no farther. But I must have got some farther, for as I came charging in to land, that miserable board poked its nose down to bottom, stopped abruptly, and turned a somersault, at the same time violently severing our relations. I was tossed through the air like a chip and buried ignominiously under the downfalling breaker. And I realized that if it hadn’t been for Ford, I’d have been disembowelled. That particular risk is part of the sport, Ford says. Maybe he’ll have it happen to him before he leaves Waikiki, and then, I feel confident, his yearning for sensation will be satisfied for a time. When all is said and done, it is my steadfast belief that homicide is worse than suicide. Ford saved me from being a homicide. “Imagine your legs are a rudder,” he said. “Hold them close together, and steer with them.” A few minutes later I came charging in on a comber. As I neared the beach, there, in the water, up to her waist, dead in front of me, appeared a woman. How was I to stop that comber on whose back I was? It looked like a dead woman. The board weighed seventy-five pounds, I weighed a hundred and sixty-five. The added weight had a velocity of fifteen miles per hour. The board and I constituted a projectile. I leave it to the physicists to figure out the force of the impact upon that poor woman. And then I remembered my guardian angel, Ford. “Steer with your legs!” rang through my brain. I steered with my legs, I steered sharply, abruptly, with all my legs and with all my might. The board sheered around broadside on the crest. Many things happened simultaneously. The wave gave me a passing buffet, a light tap as the taps of waves go, but a tap sufficient to knock me off the board and smash me down through the rushing water to bottom, with which I came in violent collision and upon which I was rolled over and over. I got my head out for a breath of air and then gained my feet. There stood the woman before me. I felt like a hero. I had saved her life. And she laughed at me. It was not hysteria. She had never dreamed of her danger. Anyway, I solaced myself, it was not I but Ford that saved her, and I didn’t have to feel like a hero. And besides, that leg-steering was great. In a few minutes more of practice I was able to thread my way in and out past several bathers and to remain on top my breaker instead of going under it. The water that rolls in on Waikiki Beach is just the same as the water that laves the shores of all the Hawaiian Islands; and in ways, especially from the swimmer’s standpoint, it is wonderful water. It is cool enough to be comfortable, while it is warm enough to permit a swimmer to stay in all day without experiencing a chill. Under the sun or the stars, at high noon or at midnight, in midwinter or in midsummer, it does not matter when, it is always the same temperature — not too warm, not too cold, just right. It is wonderful water, salt as old ocean itself, pure and crystal clear. When the nature of the water is considered, it is not so remarkable after all that the Kanakas are one of the most expert of swimming races. So it was, next morning, when Ford came along, that I plunged into the wonderful water for a swim of indeterminate length. Astride of our surfboards, or, rather, flat down upon them on our stomachs, we paddled out through the kindergarten where the little Kanaka boys were at play. Soon we were out in deep water where the big smokers came roaring in. The mere struggle with them, facing them and paddling seaward over them and through them, was sport enough in itself. You had to have your wits about you, for it was a battle in which mighty blows were struck, on one side, and in which cunning was used on the other side — a struggle between insensate force and intelligence. I soon learned a bit. When a breaker curled over my head, for a swift instant I could see the light of day through its emerald body; then down would go my head, and I would clutch the board with all my strength. Then would come the blow, and to the onlooker on shore I would be blotted out. In reality the board and I had passed through the crest and emerged in the respite of the other side. I should not recommend those smashing blows to an invalid or delicate person. There is weight behind them, and the impact of the driven water is like a sandblast. Sometimes one passes through half a dozen combers in quick succession, and it is just about that time that one is liable to discover new merits in the stable land and new reasons for being on shore. Out there in the midst of such a succession of big smoky ones, a third man was added to our party, one Freeth. Shaking the water from my eyes as I emerged from one wave and peered ahead to see what the next one looked like, I saw him tearing in on the back of it, standing upright on his board, carelessly poised, a young god bronzed with sunburn. We went through the wave on the back of which he rode. Ford called to him. He turned an airspring from his wave, rescued his board from its maw, paddled over to us and joined Ford in showing me things. One thing I learned in particular from Freeth, namely, how to encounter the occasional breaker of exceptional size that rolled in. Such breakers were really ferocious, and it was unsafe to meet them on top of the board. But Freeth showed me, so that whenever I saw one of that caliber rolling down on me, I slid off the rear end of the board and dropped down beneath the surface, my arms over my head and holding the board. Thus, if the wave ripped the board out of my hands and tried to strike me with it (a common trick of such waves), there would be a cushion of water a foot or more in depth between my head and the blow. When the wave passed, I climbed upon the board and paddled on. Many have been terribly injured, I learn, by being struck by their boards. The whole method of surf-riding and surf-fighting, I learned, is one of non-resistance. Dodge the blow that is struck at you. Dive through the wave that is trying to slap you in the face. Sink down, feet first, deep under the surface, and let the big smoker that is trying to smash you go by far overhead. Never be rigid. Relax. Yield yourself to the waters that are ripping and tearing at you. When the undertow catches you and drags you seaward along the bottom, don’t struggle against it. If you do, you are liable to be drowned, for it is stronger than you. Yield yourself to that undertow. Swim with it, not against it, and you will find the pressure removed. And, swimming with it, fooling it so that it does not hold you, swim upward at the same time. It will be no trouble at all to reach the surface. The person who wants to learn surf-riding must be a strong swimmer, and must be used to going under the water. After that, fair strength and common sense are all that is required. The force of the big comber is rather unexpected. There are mix-ups in which board and rider are torn apart and separated by several hundred feet. The surf-rider must take care of him or herself. No matter how many riders swim out with you, you cannot depend upon any of them for aid. The fancied security I had in the presence of Ford and Freeth made me forget that it was my first swim out in deep water among the big ones. I recollected, however, and rather suddenly, for a big wave came in, and away went the two men on its back all the way to shore. I could have been drowned a dozen different ways before they got back to me. One slides down the face of a breaker on the surf-board, but has to get started to sliding. Board and rider must be moving shoreward at a good rate before the wave overtakes them. When you see the wave coming that you want to ride in, you turn tail to it and paddle shoreward with all your strength, using what is called the windmill stroke. This is a sort of spurt performed immediately in front of the wave. If the board is going fast enough, the wave accelerates it, and the board begins its quarter-of-a-mile slide. I shall never forget the first big wave I caught out there in the deep water. I saw it coming, turned my back on it and paddled for dear life. Faster and faster my board went, till it seemed my arms would drop off. What was happening behind me I could not tell. One cannot look behind and paddle the windmill stroke. I heard the crest of the wave hissing and churning, and then my board was lifted and flung forward. I scarcely knew what happened the first half-minute. Though I kept my eyes open, I could not see anything, for I was buried in the rushing white of the crest. But I did not mind. I was chiefly conscious of ecstatic bliss at having caught the wave. At the end of the half-minute, however, I began to see things, and to breathe. I saw that three feet of the nose of my board was clear out of water and riding on the air. I shifted my weight forward, and made the nose come down. Then I lay, quite at rest in the midst of the wild movement, and watched the shore and the bathers on the beach grow distinct. I didn’t cover quite a quarter of a mile on that wave, because, to prevent the board from diving, I shifted my weight back, but shifted it too far and fell down the rear slope of the wave. That is a great description. Really cool, thanks for sharing.